For the first time ever, the official Pantone Color of the Year isn’t one, but two hues—actually, it’s a “blending” to be more precise. Pantone has named rose quartz, a blush pink, and serenity, a periwinkle-esque blue, the colors of 2016 because of their ability to show the “inherent balance” between a warmer rose tone and a cool tranquil blue. “In many parts of the world we are experiencing a gender blur as it relates to fashion, which has in turn impacted color trends throughout all other areas of design,” Pantone said in a news release. It’s going to be hot in weddings too: We’re picturing this combo mixing with light purples for airy pastel palettes, or with taupe and smoke green for nature-inspired themes. Previous Pantone color callouts include 2015’s marsala, which made a big impact in registry and home trends, and 2014’s radiant orchid which served as a bold accent color in wedding décor, from bouquets to fondant. This time around, we suggest you play with hints of the colors or pick the one that speaks most to your personal style. 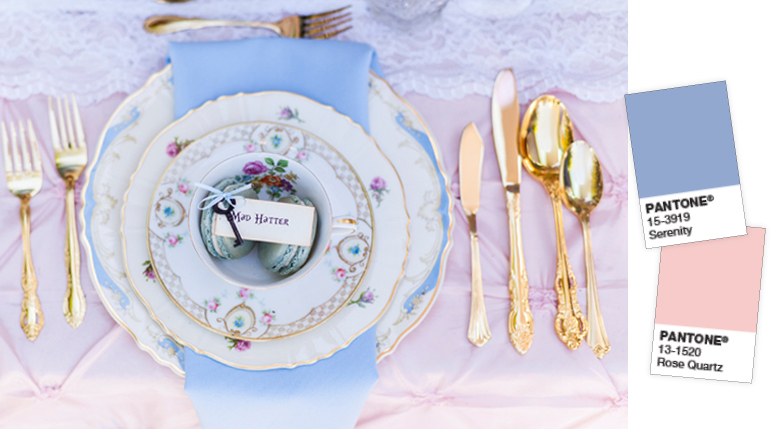 Get inspired by some of our favorite rose quartz and serenity real wedding moments! This muted blush shade can act as its own neutral when paired with bigger, bolder colors like fig or emerald. Or opt for a monochromatic look with shades of pinks. Want to add a little glam? Pair with a metallic like copper or rose gold for a combo that sparkles. If your partner isn’t jazzed about pink, give rose quartz its own moment during cocktail hour with a rosé champagne signature sip. Take a cue from the name—dusty blues and greys make for one calming wedding palette. Instead of accenting this combo with a metallic, consider adding a pattern or a texture like marble into the mix. Looking for a pop of color? Try adding leafy greens to your centerpieces and bouquets—they’re a great natural contrast. Or for more of a color statement, let serenity pop against ruby red or another rich jewel tone. Be the first to comment on "Pantone Color of the Year 2016 Revealed: 8 Rose Quartz and Serenity Wedding Ideas"